This interview and photo set originally appeared on Rehab Online Magazine. “START WITH A SEED. PLANT DAT BIH. 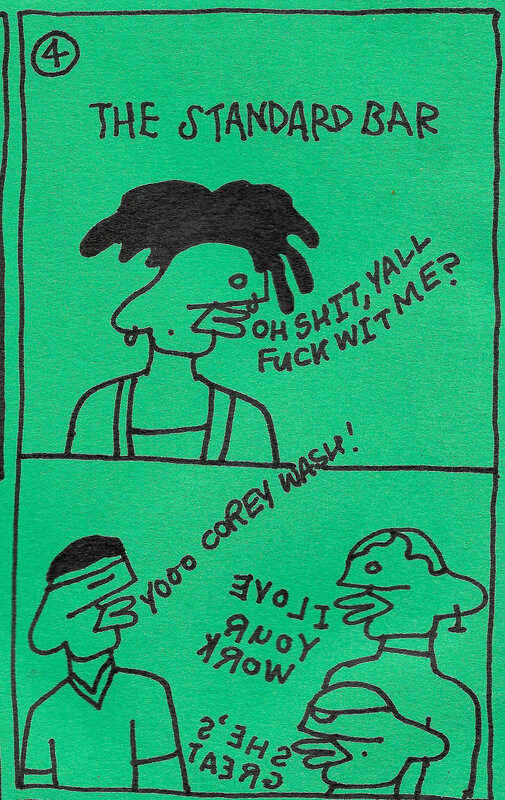 KEEP IT WATERED.” Reads one of Corey Wash’s comics drawn with a Sharpie on emerald green paper, posted on her Instagram page. Corey’s work, which leaves much of the interpretation up to the viewer, is bold, sometimes brash, and almost always positive in nature. 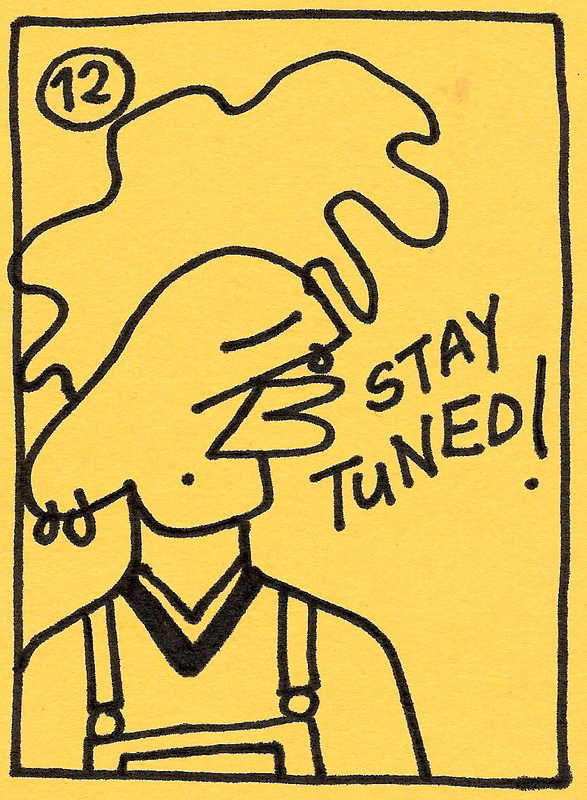 Her relatable comic creations, which often feature a ballsy character named Willoughby, cultivated an organic following for the Baltimore born artist who currently lives in Los Angeles by way of New York City. The ding of the elevator reaching the 9th floor jarred me out of a daydream. I had arrived at Corey’s apartment in downtown Los Angeles. Armed with my film camera and audio recorder, I traipsed down the hall, led by the smell of incense, to Corey’s apartment door. As she opened the door, light spilled out of the studio apartment she shares with her partner, MeLo. The sound of The Internet mingled with the incense in the air as MeLo lay on their bed working on his laptop and Corey doodled while sitting in one of their marigold chairs. Next to her lay MeLo’s trumpet and the green bass her father gifted her. Their space serves as a live-in studio- Corey’s canvases and colored paper lay on the floor and find homes pinned to the wall, markers, brushes, spray paint canisters, and cameras are strewn about. A reminder to self scratched on cream paper resides above MeLo’s keyboard. “LIFE IN LA” reads the title. “WHY AM I HERE?” Corey asks herself. “TO EXPAND + GROW” she answers in Sharpie, mirroring a common theme in her comics– the planting, cultivation, and growth of a plant… or perhaps a person. 1-How would you describe your work to someone who’s never seen it? 2-You use a lot of green, orange, yellow, and blue. Why these colors? 3- Sometimes the letters in your cartoons are backwards. Do those words have a different meaning? 4-Your social media feeds are littered with positivity. You encourage self-love, mind-expansion, and you’re always encouraging other women. You’ve created a really unique following because of this positivity and the rawness of your art. How have you been surprised by the impact of your work on others? 5- Willoughby is really direct and sometimes brash. Some of these cartoons seem like the perfect outlet for that comeback you came up with two hours too late. Is the creation of these cartoons cathartic for you? Have they ever caused conflict amongst close friends? 6- Are there versions of these pieces of art that the social media world doesn’t see? 7- Let’s talk about the juxtaposition of the cartoons. Willoughby is this whimsical looking character. The words on the page are sometimes dead serious and really raw. Is this juxtaposition on purpose? a reflection of your everyday life? 8- Willoughby is about 2 years old now. Do you see them developing and finding their voice? Can you see how you’ve evolved as a human through Willoughby? Do you feel like you've evolved from being a stand in to being ok in the spotlight? 9- I saw you at a live installation recently… You were sitting on the floor of a small, dimly lit room, doodling on the colored paper that lay on the floor. The room was filled with plants, paper, and marker. You were creating all night… how do you continue to have inspiration for that? Did you come in with ideas or were you freestyling? 10- You’re from Baltimore, spent some time in New York, and now you’re living in Los Angeles. You originally wanted to be a model... You’re now a music video director, stylist, model, muse, photographer, guitarist, designer. How do all of the worlds of art you’re a part of collide? 11- You’re friends with a lot of creatives, specifically musicians. How does your friends work influence yours? What do you listen to when you’re drawing? 12- You’ve mentioned you have a book series in the works and an installation coming to LA in may. Can you tell me more about these? 13- I hear you’re headed to NY at the end of the month to work on a few new projects. Do tell!